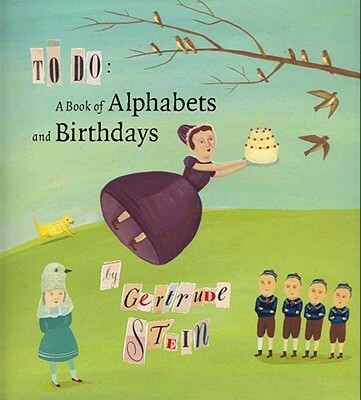 "Alphabets and names make games and everybody has a name and all the same they have in a way to have a birthday," muses Gertrude Stein in "To Do: A Book of Alphabets and Birthdays." Written in 1940 and intended as a follow-up to her children's book "The World Is Round," published the previous year, "To Do" is a fanciful journey through the alphabet. Each letter is represented by four names (including Gertrude for "G") and features a short story told in verse. " This is] a birthday book I would have liked as a child," said Stein of "To Do." Publishers rejected the manuscript as too complex for children, and it remained unpublished during Stein's lifetime. A text-only version issued from Yale University Press in 1957. Now, more than seventy years after Stein penned the story, "To Do" is appearing with illustrations, realizing the author's original concept for the book. Giselle Potter's witty and stylish illustrations provide a perfect complement to Stein's uniquely whimsical world of words, creating a truly delightful, often hilarious book that adults and children alike can appreciate and love.